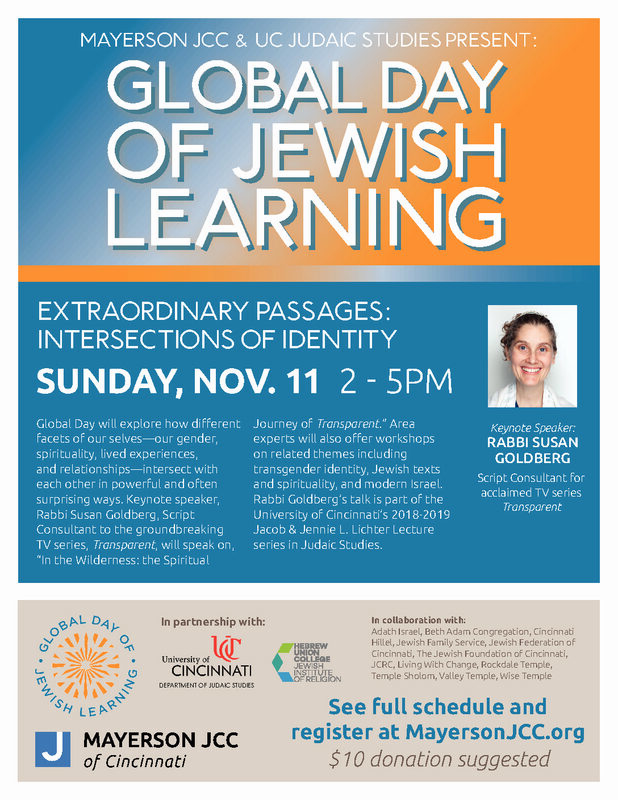 Global Day of Jewish Learning with ‘Transparent’ Rabbi – Sunday, November 11, 2-5 pm. Rabbi Susan Goldberg is the script consultant for the groundbreaking TV show, Transparent. While Transparent makes headlines for publicly depicting the life of a transwoman and her family, equally striking is the honest depiction of Judaism in popular culture. From the conversations about Israel we have when we think no one is watching, to fasting on Yom Kippur, to overcoming abuse, Transparent doesn’t hold back. Global Day starts with Rabbi Goldberg and continues with conversations about Jewish life, journeys, ‘Trans Basics’, Hollywood, and who knows what else? To find out more and register click the link below.